WESLACO — Rosalinda Montez was one of the first residents to walk into the newly opened Federal Emergency Management Agency’s Disaster Recovery Center Tuesday afternoon at the Weslaco Business, Visitor and Event Center. FEMA representatives told her an inspector would be showing up to her home on Mesquite Street within the next five days to assess damage caused by a series of harsh storms last month, which left her home in water, destroying her furniture and leaving behind mold as water receded. 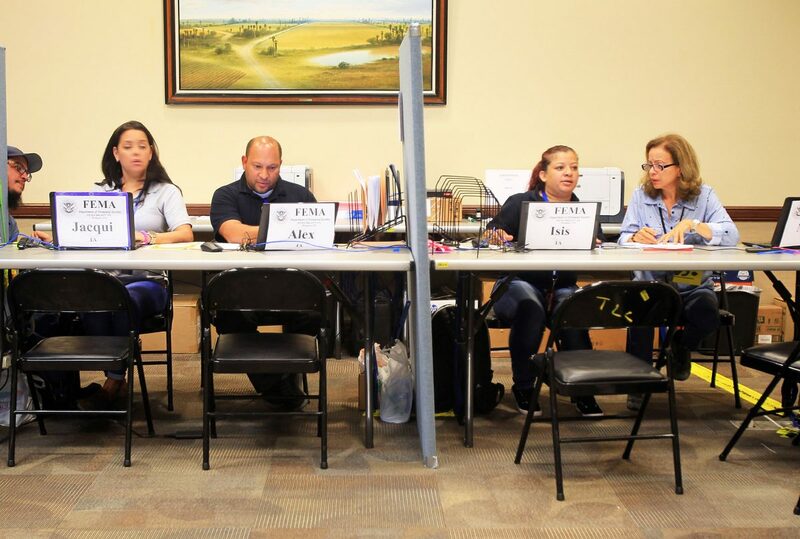 The recovery center, the first of three throughout the county, opened Tuesday afternoon to facilitate the disaster aid application process and assist residents who may have questions about the process, which remains open until Sept. 4. Representatives from the Small Business Administration, Texas Rio Grande Legal Aid and Texas Department of Insurance setup inside the recovery center to also expedite the recovery process for homeowners, renters and business owners affected by the June flood, which dumped upwards of 18 inches of water in parts of Hidalgo County. In Weslaco alone, where Montez has lived her entire life, at least 2,234 homes, 103 businesses and 2,500 vehicles were damaged by the “Great June Flood of 2018,” according to information released by the National Weather Service in Brownsville. “They took the sheetrock out of my room because I was getting so sick,” said Montez, who remains living inside the damaged home. Montez, who does not have flood insurance coverage, is “hoping” she will be awarded grant money to repair her home, which had been passed down through generations, since “everything” was damaged. Disaster legal services volunteers, through the American Bar Association, provide “basic legal advice” pertaining to legal questions surrounding the process, said Attorney Linley Boone-Almaguer for Texas Rio Grande Legal Aid. “We have to do a lot of title clearing down here because people pass their home without really ever passing it, legally,” said Boone-Almaguer. The volunteers’ work not only encompasses FEMA-related matters, but also insurance appeals, disaster unemployment assistance and lost or destroyed legal documents, among other topics pertaining to disaster recovery. Volunteers provide legal services from 9 a.m. until 4 p.m. at the recovery center. Small Business Administration representatives aid home and business owners in applying for loans to repair their damaged properties, and those with the Texas Department of Insurance help renters, home and business owners with flood insurance-related concerns. The recovery center, located at 275 S. Kansas Ave. in Weslaco, operates from 7 a.m. to 7 p.m. every day, until deemed necessary. Recover centers will open at the same hours starting on Thursday in Mission and Saturday in McAllen. “This is the place to get answers,” Smith said.